The look of total surprise on Jim Dempsey’s face was priceless. 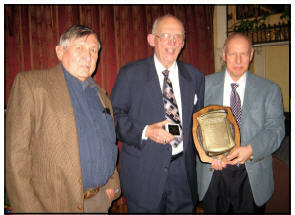 At the Collectors Club of San Francisco Christmas Dinner meeting, Jim was announced as the 2014 Chaloner Award recipient. The Chaloner Award is presented to philatelists who have made a significant positive contribution to philately in the Council area over a significant time. source of encouragement to collectors that flock to their booth. Jim is a leader among the stamp dealer community, the designated representative of the trade to the APS, and lately the spark plug that has been essential to resurrect COALPEX from fond memories to reality this next June. Thanks, Jim, from all of us!